These Wrangler jeans are made in Scotland. UK size 10. • Waist 24”. • Fastening - Zip fasten. 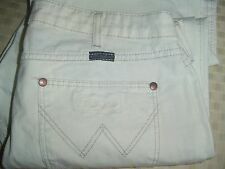 Very stylish and nice looking Wrangler Stonewashed Jeans labeled as 30 waist 30 leg Waist = 30 - 31” Inside leg = 30” Hem = 8 1/4" Mid rise = 10” Model = bootcut In very good pre loved and worn in condition some nice age related wear to hand pockets and fly Very soft and comfortable to wear Hems are excellent Very nice wash. Colour = Blue Zip fly. Branded buttons and poppers. Wrangler DENIM JEANS Material: 100% Cotton Come from a smoke and pet free home. We try our best to show every possible detail o f the item, including any def ect or flaw we found. We have highly trained person n el that thoroughly inspects every single item for authenticity. We believe in detail. WRANGLER MOM/BOYFRIEND JEANS REGULAR FIT ULTIMATE OVER DYE SIZE 25 in. to 42 in. High Waisted. Wrangler jeans. THE ULTIMATE DENIM. W36= UK 16. W35= UK 14-16. W34= UK 14. W33= UK 12-14. W32= UK 12. THEY ARE WRANGLER FARRAH JEANS. THERE IS A LITTLE MARK STILL REMAINING ON THE LEFT LEG IN THE MIDDLE AROUND THE THIGH AREA, NOTHING SIGNIFICANT AT ALL, HARDLY NOTICEABLE. (LONG LEG) THIS IS WHAT IS ON THE INSIDE LABEL. A LADIES JEANS. Blue color. 100% Genuine product. Size 30/34. 100%cotton. Style: Cary. Fit: Flare. Type: Jeans. Material: Cotton. Colour: Blue. Condition: Good Used Condition - the item shows minor signs of previous wear - Reworked length, stretched waist, light marks on the hems. 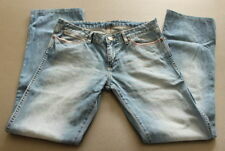 Wrangler ladies stretch jeans regular body, waist 36 leg 30, in very good condition. JEANS SIZING CHART. 28 30 32 34 36 38 40 42. INSIDE LEG 30". Wrangler mid blue straight leg jeans. Zip fly with hook at top. Jeans & Trousers. Colour: Mid Blue. Inner Leg Length: 30". Denim Shirts/Jackets. Waist: 36". Condition : Excellent. Genuine 70s flares bell bottoms gorgeous peach colour 14. Condition is Used. Made in the USA by Wrangler. Sadly no longer fit as the colour and thick soft fabric is rare to find. Small front pocket effect detail and back buckle. INSIDE LEG 28" TAKEN UP. JEANS SIZING CHART. 28 30 32 34 36 38 40 42. RISE 10.5". 30 moneyback warranty. SWIFT: INGBPLPW. IBAN: PL 34 1050 1298 1000 0091 1688 1989. Bank account details Size and fit are approximations and may vary across designers. 3XL 60 30 118 50R XXL. 3XL 58 29 114 48R XL. These Wrangler ladies jeans are made in Mauritius. Shortened but in excellent used condition. Appear hardly worn. Dark indigo. 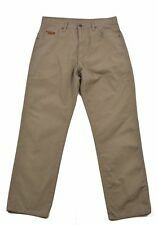 Embroidered rear pockets. • Fastening - Zip fasten. • Inside leg 30 1/2". The jeans has been worn / have small marks at the front right leg and the label at the back pocket missing as shown in the picture. Style label has been cut out.